If you take medication regularly, why do you take it? Why that specific medicine? Hopefully, the answer is that you take it for a genuine medical need and, along with your doctor and pharmacist, you chose that specific medication because it is the best fit for your medical needs. A lot of attention has been paid in recent years to how money intrudes on medicine, specifically people’s inability to afford the medicines they need. However, money also intrudes in other ways as shown by the long story of Risperdal and the allegations of improper marketing of pharmaceuticals. This is yet another area in which the False Claims Act (“FCA”) can be used to combat health care fraud and our pharmaceutical marketing fraud law firm is prepared to be part of this fight. One of the longest Department of Justice (“DOJ”) press releases we’ve read on FCA claims dealt with one of the largest FCA settlements — Johnson & Johnson’s (“J&J”) agreement to pay $2.2 billion to settle a variety of claims involving off-label marketing and kickbacks. The settlement includes both criminal and civil allegations. The claims largely surround the drug Risperdal which, for most of the time involved, was approved only for the treatment of schizophrenia. In a related civil complaint, the government alleged J&J and Janssen’s marketing tactics, including but not limited to the payment of kickbacks to doctors and pharmacies, led to false claims being submitted to government health care programs for uncovered, off-label uses of Risperdal. These actions allegedly targeted children, the elderly, and individuals with developmental disabilities. The government further suggests that these tactics downplayed serious risks to elderly patients and to children uncovered in drug testing. To settle these and other claims, J&J made various payments to the federal government and to certain state governments totaling in excess of $2.2 billion. J&J also agreed to abide by a stringent Corporate Integrity Agreement to prevent future fraud and abuse. Promoting off-label uses of medications is both illegal and dangerous. 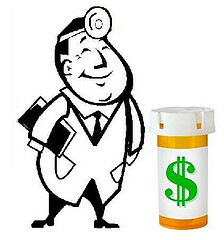 In a 2014 press release detailing the settlement of another off-label promotion case brought under the FCA, the U.S. Attorney involved in the prosecution explains: “”Marketing efforts that influence a doctor’s independent judgment can undermine the doctor-patient relationship and short-change the patient.” If you are aware of off-label promotion by a drug company, you can play a part in fighting health care fraud. Call our health care fraud law firm to learn how.